Located in the constellation Vulpecula, two diffuse emission nebula, Sh2 88 (upper center large red area) and Sh2-87 (brighter red area near center bottom) contain star forming regions. These two nebula range from 6,800 to 7,500 light years distant. Near Sh2-88 and just to the left are two bright red knots called Sh2-88A (right) and Sh2-88B(left). 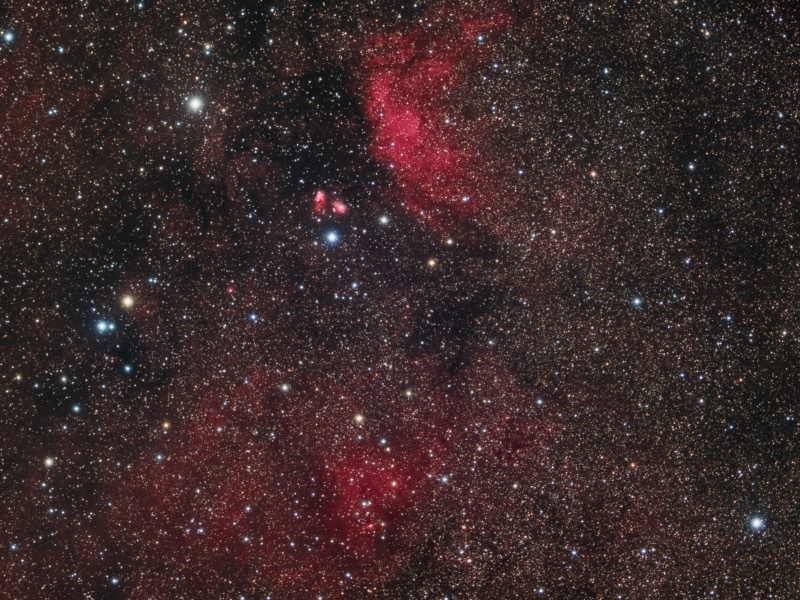 Sh2-88B is thought to be an active star forming nebula complex. Within Sh2-87, are two other small objects that also are star forming nebula. Sh2-87 E and Sh2-87 W. These small features can be seen on this annotated image and a better view on this full resolution image. This image combines 13hrs of Ha exposures and 15hrs of Red, Green and Blue exposures combined to make a color image.